From Old Occitan gran, from Latin grandis, grandem, ultimately from Proto-Indo-European *ghrewə- (“to fell, put down, fall in”). “gran” in Diccionari de la llengua catalana, segona edició, Institut d’Estudis Catalans. 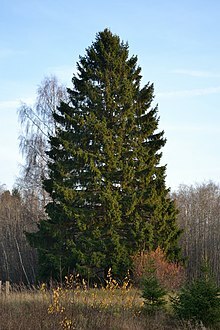 spruce (mostly the species Picea abies (Norway spruce)). “gran” in The Bokmål Dictionary. “gran” in The Nynorsk Dictionary. From Old Occitan gran, from Latin grandis, grandem. From grande, from Latin grandis, grandem. From Old Spanish grant, grand, apocopic forms of grande (“great”). Other apocopic forms inherited from Old Spanish include primer, san and según. (before the noun) Apocopic form of grande; great. The form gran is used only before and within the noun phrase of the modified singular noun. Elsewhere, grande is used instead.